During our brief getaway to Beantown, I made two intentional stops to sate my sweet tooth. 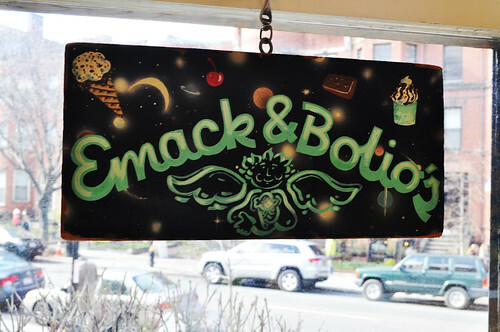 The first was to Emack & Bolio's on Newbury Street, whose tagline is "Ice Cream for the Connoisseur." The enterprise actually began back in 1975 inside a basement located in the Coolidge Corner section of Brookline, Massachusetts as a place for musicians to hang out after their gigs and to enjoy some homemade ice cream. Started by a group of "hippie lawyers" who had been working pro bono for the homeless, for gay civil rights, for anti-war demonstrators, as well as representing all these famous rock 'n' rollers who were being signed by major record labels. Additionally, two homeless gentlemen that the lawyers did this pro bono work for asked that the shop be named after them, thus Emack & Bolio's was born. The psychedelic and cosmic theme running throughout is redolent of the time of the ice cream shop's founding. 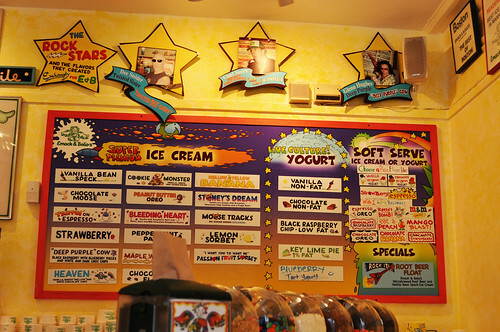 The menu offers a wide array of ice creams, sorbets, yogurts, and soft serve ice creams/yogurts. 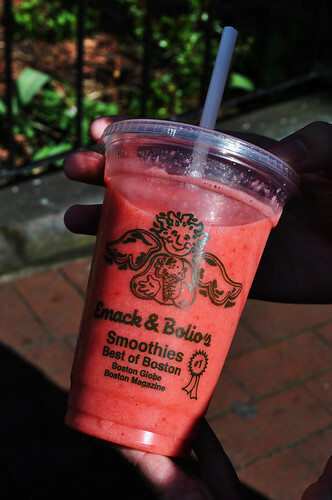 Along with these items, Emack & Bolio's also claim fame to making the best smoothies. As much as I wanted to get some ice cream (some of those flavors look so good), I decided to play it safe with passionfruit sorbet, as my tendency for being lactose intolerant keeps me away from those milky treats. I liked that it was a bit tart and that its texture wasn't too icy. Marcus decided to try the the Citrus Cooler smoothie with orange juice, lemon sorbet, raspberries, and sparkling water. He enjoyed this quite a bit as the smoothie was well blended, as the combination of citrus and berry offered a refreshing respite. It was nice to see a smoothie made from fresh ingredients. On the day of my departure, I sneaked in a trek to the North End of Boston for a visit to the touristy Italian pastry shop, Mike's Pastry. 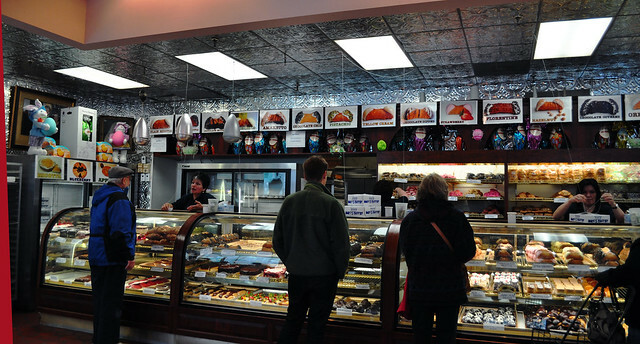 Recommended to me by Christine, Mike's Pastry is filled with Italian confections and sweets. 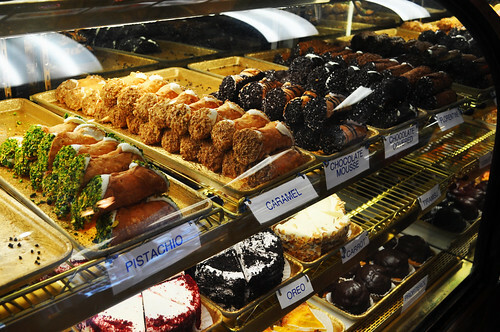 Its most popular items are its wide varieties of gigantic cannolis. Since Marcus had to get to his conference early, I had to conquer the cannolis at Mike's Pastry solo. After much contemplation, I chose the amaretto cannoli and pistachio cannoli. They were both really nutty in their own way filled to the shells' brim with classic mascarpone cream. The amaretto cannoli was a lot sweeter than the pistachio, probably because the mascarpone was infused with amaretto liquer and the pastry shell was drizzled with hardened dark chocolate. The pistachio cannoli, however, had the perfect balance of sweetness and nuttiness from the crushed pistachios. The mascarpone filling here, as with the amaretto cannoli, was infused with pistachios (most likely with an oil or paste). While I enjoyed both cannolis very much, I think I preferred the pistachio over the amaretto due to level of sweetness. Unfortunately, though, I was only able to eat half of each before I hit a sugar coma and a point where my stomach could no longer tolerate the large globs of mascarpone, no matter how delicious each bite was. Findings: It was great to be able to try a couple "signature" Beantown dessert shops during my brief trip there. I wish I could have stayed longer to try a few others (Christina's Homemade Ice Cream among one of them), but there's always next time! 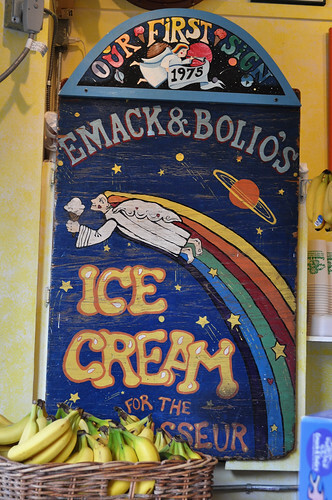 Emack & Bolio's was fun, and I wish I could've tried more flavors. That's when going in a larger group comes in handy -- you can mooch off of each other's treats to get a fuller experience! 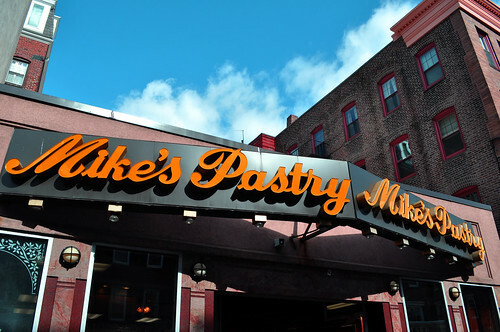 Mike's Pastry was lovely as well -- I've never seen such huge cannolis in my life! I liked that the bakery had an astounding variety of cannolis (as well as other Italian pastries) with original flavors. Only thing is I wish they offered smaller ones (i.e., bite size) and just a regular plain, old cannoli because sometimes the cannoli fix I need is just a small bite of basic pastry and mascarpone and I'm good to go. 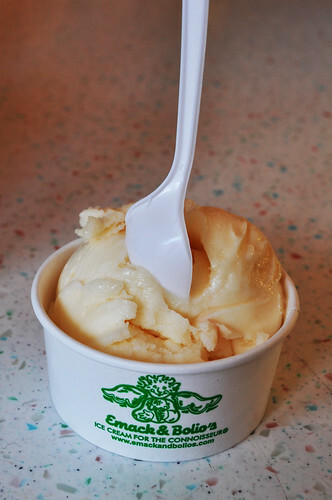 Either way, these two spots are great dessert spots to hit up whenever you happen to be in the Beantown area. 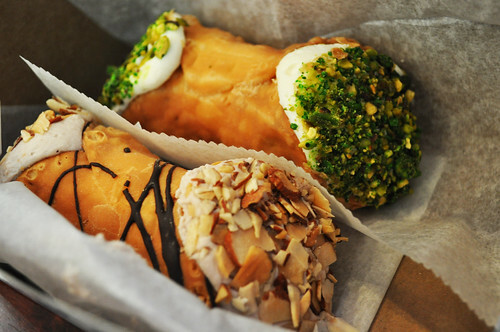 Price point: $3.50-5.50 for each treat at Emack & Bolio's, $3.50 for each cannoli from Mike's Pastry.